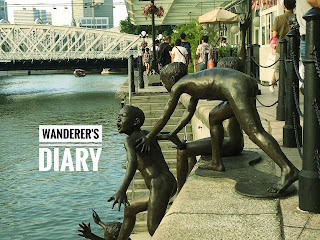 Wanderer's Diary: "Crossing Cavenagh Bridge"
There is no greater pleasure than walking by the river and if the river showcases interesting art elements as you walk by, the pleasure is inexplicable. 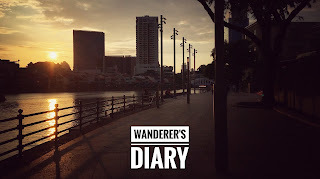 That is my experience as I walked by Singapore River. 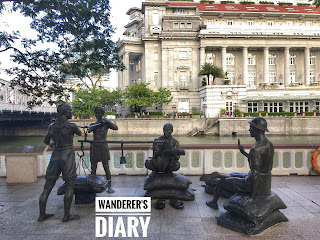 Interesting details, excellent depiction, so much to see in Singapore River Trail. 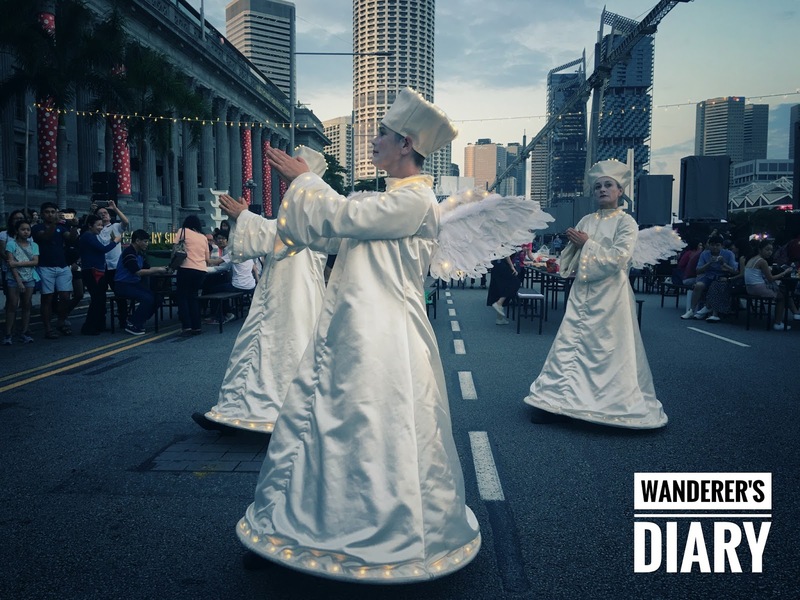 In the global modern art arena, Singapore has an important role representing contemporary Asia. Cavenagh bridge is one of the oldest bridge in Singapore. It was built to connect the financial district and the colonial buildings during the 19th century. Located near the Fullerton Hotel in Singapore, the suspension bridge is in its oldest form since its construction. When entered from the Fullerton Hotel, the bridge welcome us with wonderful things to offer. 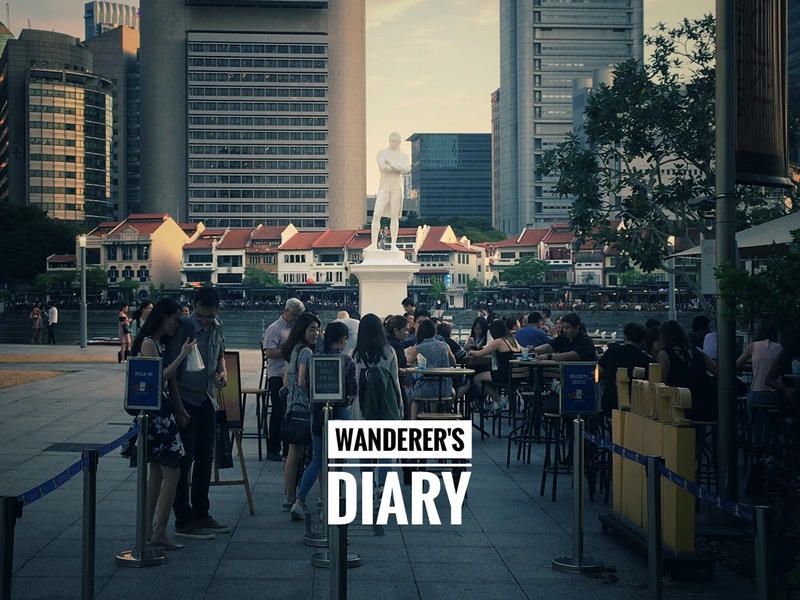 The Fullerton hotel itself is a great piece of architectural work and one of the important neoclassical building in Singapore. The sound sculpture by Baet Yeok Kuan is one of the exciting sculpture around this area. 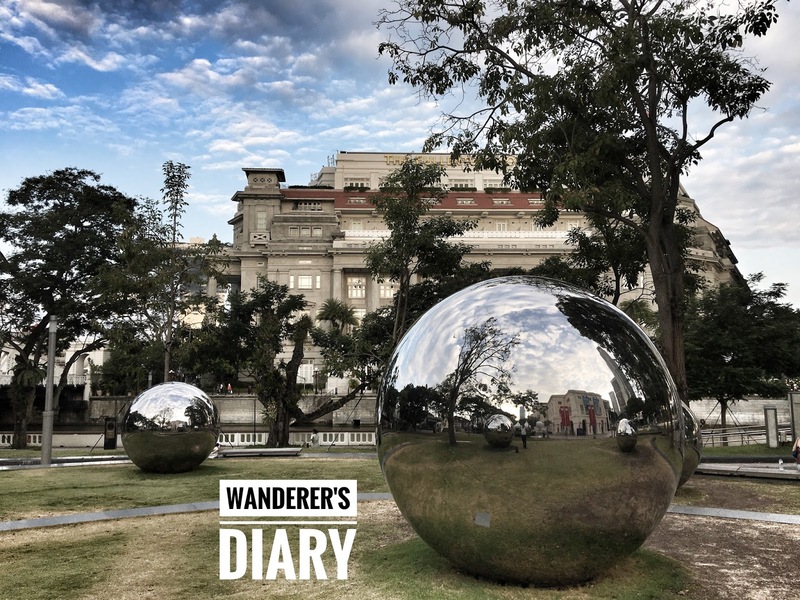 Located near the Asian Civilisation Museum, this sound sculpture plays back the sounds that you will hear in the daily Singapore life. The steel balls reflect the sky, clouds and the buildings around giving the never before excitement. As we walk further on the trails of Jubilee Walk, we shall find the famous "Raffles" statue. Installed in the place where he originally landed. Singapore was a fishing village when he landed and his contributions to turn it into a trade center are highly regarded even today. 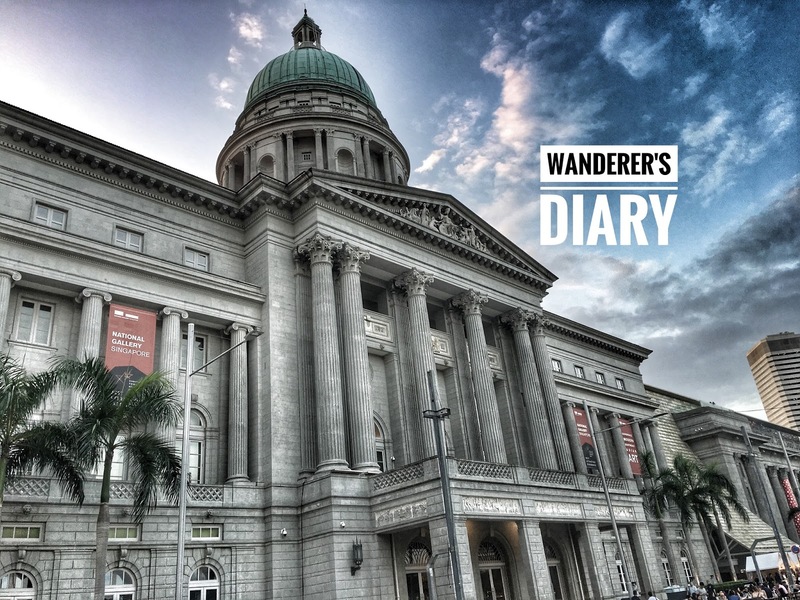 Victoria theatre is another beautiful masterpiece in Singapore architectural landscape. 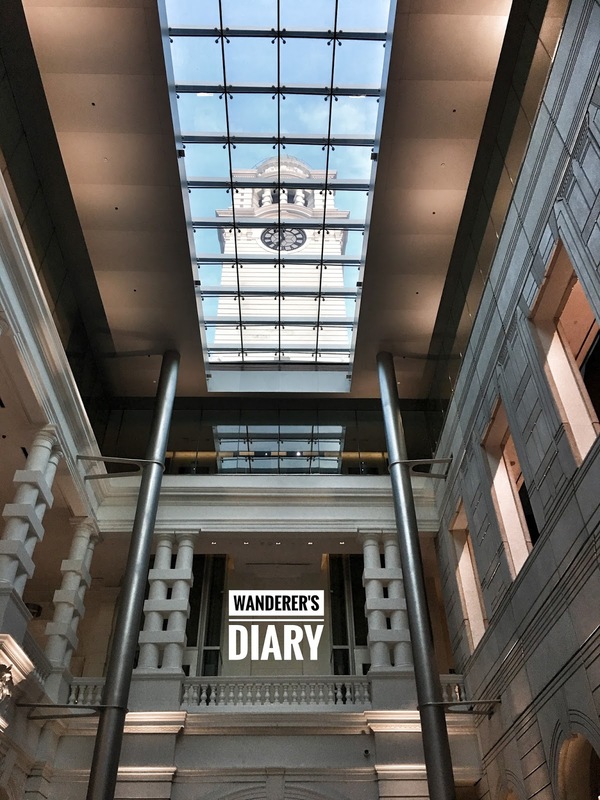 Located near the Raffles statue, this building, the clock tower and every element of it admires you. One of the neoclassical buildings in Singapore, but unique in terms of size and beauty. The dome and the columns are amazingly built. There are 15 galleries here. This place requires at least a day to explore. There are also artists performing on the road and inside the gallery offering loads of entertainment. There is a deck in National Gallery, named after the architect "Coleman" who was the instrumental architect of some iconic Singapore buildings. 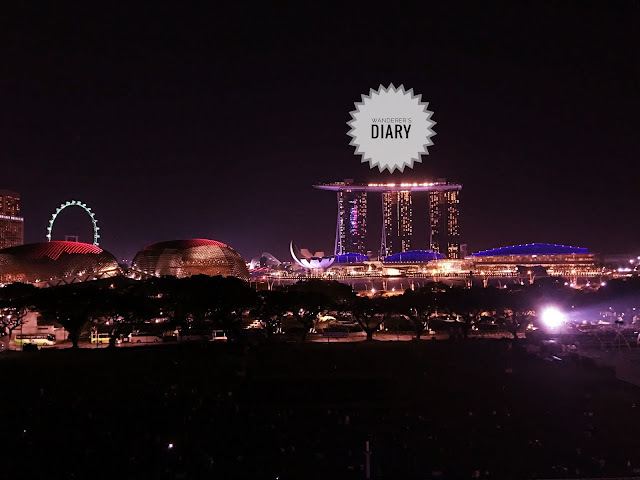 The deck gives an exciting view of the Singapore's financial and civic district. Japanese food, "Ramen" has an interesting history. Prior to 1950s, "Ramen" was also known as "Shina soba", which directly translates to "Chinese Noodles". Due to this reason, it is believed that "Ramen" is an immigrant dish from China to Japan. It could be a gift to Japanese cuisine by their Chinese neighbors, but the history is unclear. It might have originated from China, but "Ramen" is a popular food in Japan, especially among the working class. This is largely due to the simplicity of the Ramen preparation and it can be prepared very quickly. The "Ramen" is boiled in hot water and it was dipped in the ice bucket for few seconds to make it cold. They hold it in the ice bucket depending on how cold you would like it. Then, they leave it in the vegetarian broth and add other toppings such as Sprouts, Tomato, Bamboo Shoots and Spring Onions. It was prepared in less than 5 mins. Unlike the instant noodles sold in the supermarkets that are tasteless, these noodles were the tastiest noodles I have ever had so far. Professor "George Solt" has researched a lot about the origins of "Ramen" and has published a book titled "The Untold History of Ramen: How Political Crisis in Japan Spawned a Global Food Craze". He has linked US' influence and wheat import in Japan to Cold War and Communism. Read the "New Yorker" article in the link below, to learn more about "Ramen" and its history. Artificial Intelligence is making news every day. Numerous online medias have made it really difficult to separate the reality from hypes and myths. I came across the slides from Luminary Labs. Starting with the most common myth "AI is coming to take your jobs", these slides from Luminary Labs has discussed a variety of myths about AI and tried to explain. It's an interesting read. Before you read this post further, I suggest you, to go through the slides. Should you go deeper into the content, it raises a lot of questions that are not answered. For instance, these slides claim that "AI will augment human" and it also declares "Human jobs won't go away, but it will change. Roles will be more creative and specialized". This naturally raises a series of questions: what will happen to people who are not creative? What if you don't have any special skills? These slides claim that "the more machine we employ, the more people skills we need". Really? If yes, how? Probably we may need few people to manage the machines, but what happens to the rest? The airplanes have already adopted the automation during flight. However, the cars on road pose a completely different challenge. Some algorithms forces at least one should be in the driver seat to control in case of a malfunction. During a lunch with one of my client, an executive officer representing from a reputed organisation, raised an important question: "Imagine that you are writing an AI program that deals with the driving algorithm, what would the logic be in a situation where the car has to hit a human to avoid an accident?". Should the car save the passenger? or should the car save the other human being on the road? One may argue that in a fully automated world, this situation may not arise. My question to them: what should happen while we are in the beginning stages? Machine learning definitely has its benefits without a doubt. For instance, the promises to read human health data for better prediction is definitely a boon to doctors and society. ML is already helping us a lot in finding friends in social networking site and finding your next interesting movies and the techniques employed by Netflix like companies are quite effective. I liked the majority of the movies suggested by the algorithm. Sometimes, it goes overboard by presuming that you will like Bollywood cinemas if you are an Indian. This is the algorithms' failure to understand the cultural diversity of a country like India. I believe this can be corrected as the algorithm evolves. How to teach the machine to understand cultural diversity and regional intrinsic values of a person? A student that I met shared his opinion: "You can only teach the machine logics, but you can't teach it to be creative." What is your opinion? I believe it is too early to predict AI's impact, but we can only imagine now. I entered Sangeetha Bhavan without any expectation and ordered a meal. I feel now that I made the right choice. A wholesome meal that has every item deliciously prepared. Let's start with sweet; Payasam was perfectly sweetened and it allowed my tongue to generate more than enough saliva to digest my food. I have an opinion that many places don't enough sweet when it comes to "Payasam". The cook in this restaurant has felt the need for the right amount of sweetness. amount of spices. Even the most of the renowned restaurants mash this up and make it a terrible dish to eat. Sambar was good. The more Kuzhambu was made of raw banana. Rasam was just perfect with rightly souring and had a great smell. Mango pickle, a hard to find preparation in restaurants. It goes very well with the curd rice. Overall, a great meal for 8.90$. A must try! 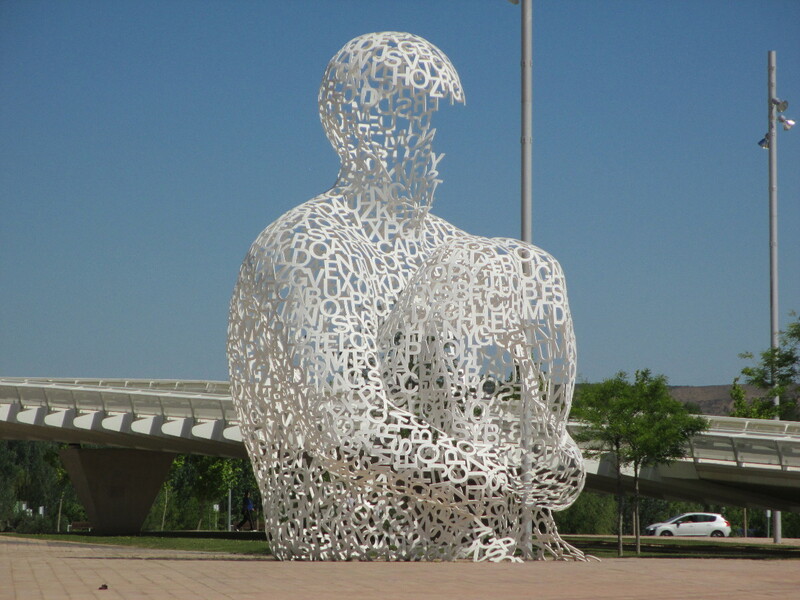 "Soul" is a sculpture designed by the Spanish artist "Jaume Plensa". The sculpture is present in the prime area of Singapore, Raffles Place near the MRT. It is hard to miss this sculpture if you are going via Robinson Road to Nicoll Highway. The sculpture "Soul", symbolically represents the cultural unity and harmony of different ethnicities such as Chinese, Indian, Malay and English in Singapore. This sculpture is made of letters from all local Singaporean languages, Chinese, English, and Tamil. A beautiful representation, indeed! The sculpture is hollow and allows anyone to enter inside, probably a symbol of "acceptance"? After seeing this sculpture of Jaume Plensa, I checked out his other works in public space. Looks to me like, he has a liking of human and faces as most of his works reflect this. In fact, there are at least 12 sculptures looking very much similar to Singapore Soul, built all over the world. 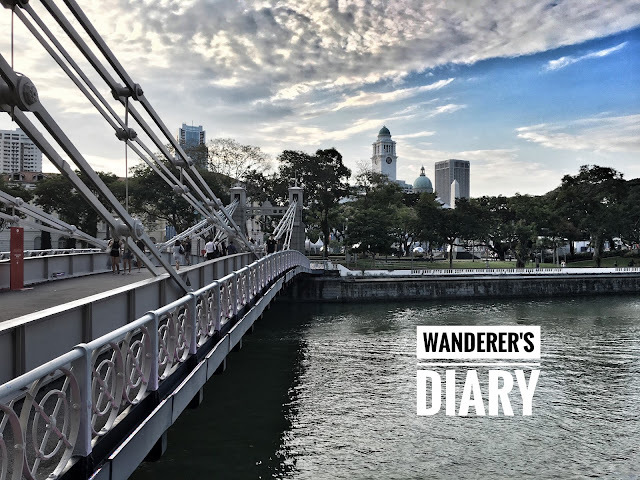 Wanderer's Diary: "Tangyuan and Mei Heong Yuen Dessert"
The inclusion of Sesame seeds in your recipe can turn an average dish into a tasteful one especially if you are making a sweet. There are a countless dessert or sweet recipes using sesame seeds in most of the cuisines. Think of a Sesame mochi in Japanese cuisine or a dry Sesame sweet balls ("Ellurundai" in Tamil) in Tamil cuisine. One can see Sesame candies throughout Malaysian food streets. That's the popularity of Sesame seeds! 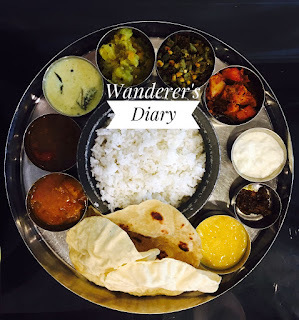 Unlike planned visits, wandering has a unique benefit as it allows you to see, taste something by experience and cherish it in the days to come. As I was wandering around Chinatown in Singapore, "Mei Heong Yuen Dessert (hereafter MHYD)" invited me inside at a first glance. I can't resist myself after seeing so many desserts in one place and that too traditional recipes! Located near China Town MRT, this outlet serves different varieties of traditional Chinese sweets. One of the desserts offered is "Tangyuan". Tangyuan or tang yuan is the Chinese name of this dessert. Emperor Yuan Shikai gave this name of Tangyuan as the original name "yuanxiao" sounded similar to remove yuan. This dessert is a common one in Hakka and Cantonese cuisine. Tangyuan roughly translates to "round balls in a soup". It is made using glutinous rice flour, sesame/peanut paste or a similar sweet paste. For the soup, boiling water or ginger soup is used. There are other variances of this soup as some recipes suggest to use just hot water and few other recipes suggest sugar syrup water. No matter how many recipes are out there; one thing is common among all: "hot water". I personally feel hot water is what is making this dessert into a great one. In MYHD, tang yuan has two varieties: Sesame fillings or peanut fillings. For S$3, MHYD offers 4 sweet balls with both varieties. The glutinous rice balls are sticky and it is served in the hot ginger soup. The trick is to eat the sweet ball as a "whole" that gives a complete taste of this dessert. If eaten by taking a bite, either you end up tasting the rice flour or just the paste. In my opinion, tasting it as a whole ball gives the right and perfectly blended taste. A similar South Indian dessert is made on the occasion of "Ganesh Chathurthi" called "Ellu Mothagam". The only difference is the shape, hot water/soup and the usage of jaggery instead of sugar as used in tang yuan. தஞ்சையில் இருந்து காரில் சென்னை திரும்புகையில், திண்டிவனம் அருகே ஒரு உணவக வாசலில் பெரிய புத்தகக் கடை போட்டிருந்தார்கள். நிறையப் புத்தகங்களின் நடுவே, ஒரு புத்தகம் மட்டும் என்னை, என் கவனத்தை ஈர்த்தது. சற்றும் யோசிக்காமல் என். சொக்கனின் "மொஸாட்" புத்தகத்தை வாங்கினேன். இரண்டு நாட்கள் கழித்து சிங்கப்பூர் விமானத்தில் ஏறியவுடன் இந்த புத்தகத்தை தான் கையில் எடுத்தேன். 'Munich' திரைப்படத்தை பார்த்ததில் இருந்தே மொஸாட் பற்றி படிக்க வேண்டும் என்ற எண்ணம் மேலோங்கியது. இந்த திரைப்படத்தை பார்த்தவர்களுக்கு நான் சொல்வது புரியும். அப்படியான சாகசங்கள் நிறைந்த படம். புத்தகத்தின் தலைப்பால் ஈர்க்கப்பட்டு தான் வாங்கினேன். தலைப்பினால் ஈர்க்கப்பட்டு பல புத்தங்களை வாங்கி ஏமாந்து போய் இருக்கிறேன். இதுவும் அது போன்று ஒரு புத்தமாகி விடுமோ என்று முதலில் தயக்கம் தான். ஆனால், கையில் எடுத்த இரண்டு மணி நேரத்தில் படித்து முடித்தாகிவிட்டது. ஒரு திரைப்படத்தின் திரைக்கதையை படித்த ஒரு உணர்வை ஏற்படுத்தி இருக்கிறார் என். சொக்கன். புத்தகம் முழுதும் எளிய வார்த்தைகள் கொண்டதாகவும், 'நடை' படிப்பதற்கு இலகுவாகவும் இருப்பது சிறப்பு. அடுத்தது என்ன என்ற தேடலையும் நமக்குள் உருவாக்குவது மிகச் சிறப்பு. "மொஸாட் புலி, தன்னுடைய அவமானக் காயங்களை நக்கிக் கொண்டது. முன்பை விட அதிக வெறியுடன் பாயத் தயாரானது!" என்று பதிந்திருக்கிறார். இது போன்ற எழுத்துக்கள் தான் இந்தப் புத்தகத்தை வேகமாக படிக்கவும், கீழே வைக்காமல் முடித்துவிடவும் தூண்டுகிறது. இன்னோர் இடத்தில், மொஸாடின் சாமர்த்தியத்தை, இப்படி எழுதியிருக்கிறார். "மொஸாடின் சாமர்த்தியம், அவர்கள் ஒருவரைப் பின்தொடர்கிறார்கள் என்றால், அது அவருடைய நிழலுக்குக்கூடத் தெரியாது"
ஆங்காங்கே, "டொனோவன் உள்ளுக்குள் சிரித்துக்கொண்டான், 'அது எங்களுக்கு ஏற்கனவே தெரியும்டா, மவனே'" என்று நம்மை சிரிக்க வைக்கவும் செய்கிறார். எடுத்ததில் இருந்து கீழே வைக்க முடியாமல் படித்த புத்தகங்கள் மிகவும் குறைவு. இது போன்ற புத்தங்கள் இருந்தால் ஒரு 'Subject'-ஐ எளிதில் அணுகித் தெரிந்துக் கொள்ளலாம். அதற்காகவே என். சொக்கனின் 'மொஸாட்' திரும்பத் திரும்ப படிக்கலாம். The introduction must be interestingly told in a way that evokes interest in you to watch. Writer Charu Nivedita in one of the articles mentioned about "The Turin Horse" movie and praised for its making. 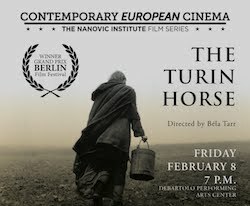 He wrote about the introduction scene of the movie and that was compelling enough to watch "The Turin Horse". If you see the opening scene of this movie, you will realize why this movie is celebrated for its making. The movie starts with an old man riding his horse cart - a long shot that runs for more than 5mins. 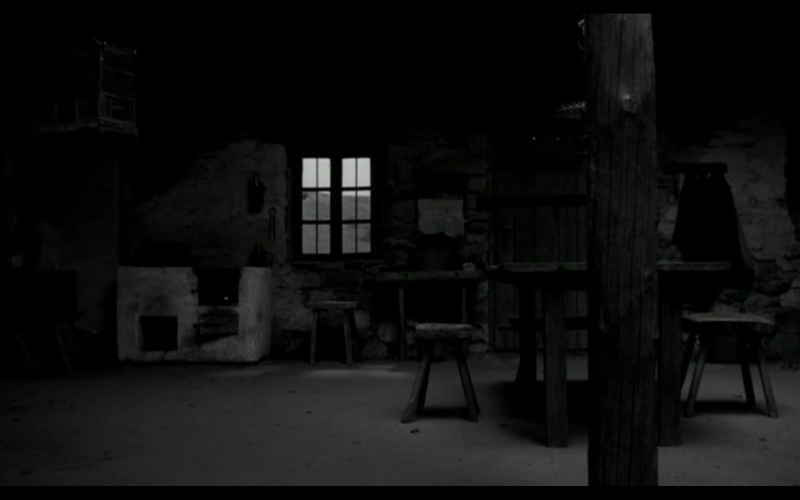 Bela Tarr's close up shots in this movie are really enjoyable. The scenes don't require any dialogues; just the camera angle, the wind, dry land with dirt, the moments that are captured and the music are enough to keep you engaged in the movie. Throughout the movie, there are only two characters: A father and the daughter. They are doing the same activities every day; yet, you will not feel bored watching them. I think it is possible only if the movie is made interesting in every frame with a poetic touch just by using the articles in a countryside household. The articles include clothes drying on a rope, a wood burning stove and a cooking pot on it, eating plates, dining table and the bed. One will wonder how these normal household articles can be interestingly shown throughout the movie with little light and a great sense of camera angle. A movie like this doesn't require extravaganza sets, expensive computer graphics, and not even a story! Light is all for a great cinematography. In this movie, light excites you to the fullest extent. For instance, the transition from Day 1 to Day 2 is beautifully shown: at first it is complete darkness, then the light comes through window and it spreads into the room slowly, the objects are shown as the light spreads through - There can't another poetic way of showing this transition! The following pictures show the sequence of the Day 2 scene in few seconds interval. It looks to me that just the presence and absence of light can give you a great experience of movie watching. I couldn't remember seeing any movie that has a scene like this. 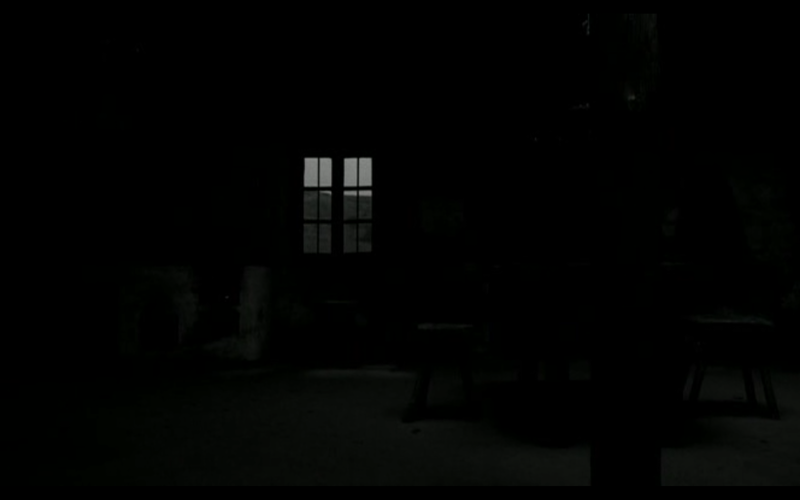 It just feels that Bela Tarr wanted to paint every frame in the best possible way. As a result, the movie gives you a great painting in every frame. I am a novice, but I think this movie has a lot to teach such as camera angle, music, and lighting. Watch the camera as it moves when a man enters the house to buy Palinka (a drink). This is one of the lengthiest scenes in the movie. As you watch, you will be able to realize the camera has movements: a slow and unnoticeable movement.  When the monologue finishes and the man walk out, the camera moves closer to the window and show him through the window. I am not sure if they found a house opposite to the single tree or the house was built opposite to the single tree for this movie, but I must say this single tree standing opposite to the house has a lot to excite you throughout the movie. The wind plays an important role throughout this film. Right from the introduction scene, all the scenes in which the daughter goes to bring water from the well or the gypsies scene: as the father character comes to rescue with the right hand close to the body and one hand raised with the axe - the wind has completely transformed this scene. 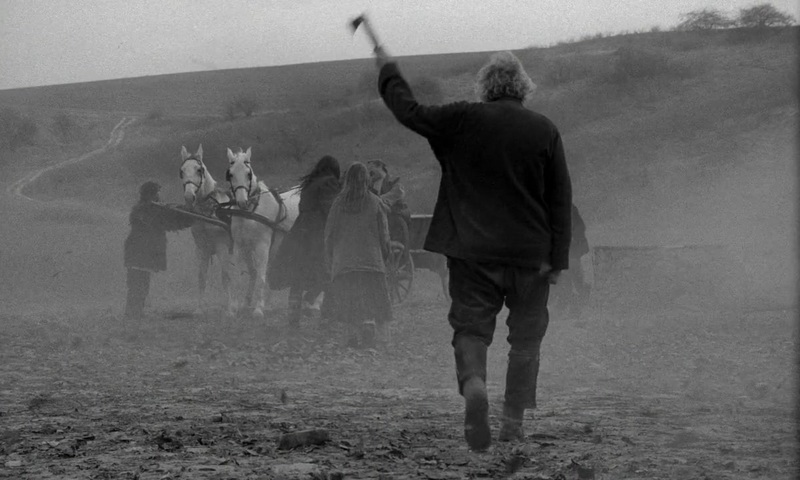 Bela Tarr's "The Turin Horse" has given me a whole new experience of cinema and it cannot be explained in few words. I believe the rest can't be told, but only to be experienced! An important event for those who watch industrial automation closely. 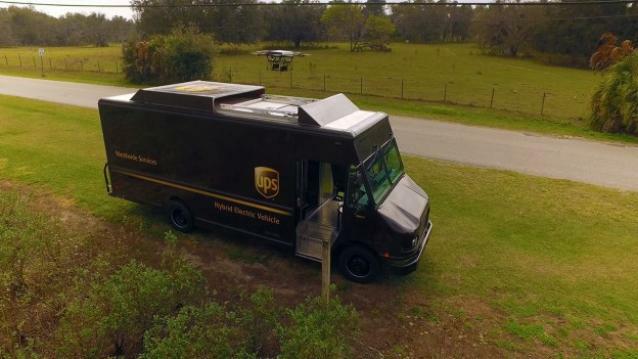 United Parcel Service (UPS) has recently tested drones for delivering packages to remote areas. The drones are supplementing the existing delivery trucks to deliver packages. The drone weighs 9.5 ounces, it can fly for 30 mins and uses GPS to deliver the goods/packages to the designated customer address. Unlike other drone tests, this test incorporated a day-to-day delivery operations. Ohio based Workhorse group was behind this test as the company built the drone that was used for this test. With this successful key event, February 2017 will be an important month in the industrial automation timeline. முகநூல் நண்பர் திரு. மந்திரமூர்த்தி, தனது சுவரில் ஜெயமோகனின் கட்டுரையைப் பகிர்ந்திருந்தார். மேலோட்டமாகப் பார்ப்பின் கட்டுரை அருமை. மேலும் அதை ஆழ்ந்து அணுகும் போது விமர்சனங்களின் அரசியல் புலப்படுகிறது. "விமர்சனம் கூடாது என்பதல்ல நான் சொல்லவருவது. விமர்சனம் ஆழ்ந்து அறிந்த ஒருவரால் சமநிலையுடன் செய்யப்படவேண்டும். 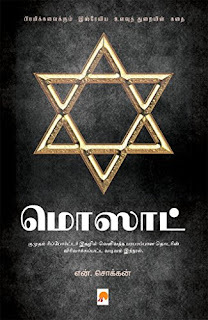 முழுமையாகச் சொல்லப்படவேண்டும். சீண்டும் கூற்றுகள், பொத்தாம்பொது அபிப்பிராயங்கள், நக்கல்கிண்டல்கள் விமர்சனங்கள் அல்ல." - ஜெயமோகனின் கட்டுரையிலிருந்து. ஜெயமோகனின் மேற்குறிப்பிட்டக் கூற்று விமர்சனத்தின் கட்டமைப்பு சார்ந்தது, மிக நுணுக்கமாகப் பார்க்க வேண்டிய ஒன்று. அவரின் இந்தக் கருத்தோடு பலரும் ஒத்துப் போகக்கூடும். ஆனால் இங்குப் பிரச்சினை, விமர்சனத்தின் கட்டமைப்பு பற்றிய புரிதலின்றி விமர்சனம் எழுதுவதல்ல. விமர்சனத்தின் கட்டமைப்பு பற்றிய ஒரு புரிதலின்றி எழுதுபவர்கள் விமர்சகர்களாக இருக்க முடியாது. அவை விமர்சனமும் இல்லை. இங்குச் சிக்கலே விமர்சிக்கும் போது, விமர்சகரின் சமநிலையற்ற உள்ளுணர்வு வார்த்தைகளாய் வடிக்கப்படுவது தான். ஜெயமோகனின் அரசியல் நிலைப்பாடு சார்ந்த கட்டுரைகளில் "எழுதியவரின் பெயரைப் பார்ப்பேன்" என்று அவரே பொத்தாம் பொதுவாக எழுதி இருக்கிறார். ஆக, இது வெறும் கட்டமைப்பு பற்றியது மட்டுமல்ல. விமர்சிப்பவர் சமநிலையின்றி இருக்கும் எழுத்தை வாசகனால் எளிதில் அடையாளம் காண முடிகிற போது, எழுதுபவரால் காண முடியவில்லையா? அல்லது சமநிலையின்றி மனது இருக்கும் போது விமர்சனம் எழுதுவது எழுத்தின் அரிப்பா என்பது புரியவில்லை? அது ஒரு புறமிருக்க. பொதுத் தளத்தில் ஒரு படைப்பு விமர்சனத்திற்கு உட்பட்டது தான். ஆயினும், விமர்சனமானது அதன் எல்லைகளுக்குள் இருந்து விட்டால் புதிய எழுத்து, புதிய படைப்பு, புதிய முயற்சி, புதியவர்கள் என்ற 'சுழற்சி' இருந்துக் கொண்டே இருக்கும். கீழே உரலியில் இருக்கும் ஜெயமோகனின் கட்டுரையில் எது விமர்சனம் அல்ல என்பதைக் கொடுத்திருக்கிறார். இதற்கு முன்பு மாலன் அவர்கள் தனது கட்டுரையில் ரசனை சார்ந்த இலக்கியத் தரத்தைப் பற்றியும் எழுதி இருந்தார். இது இரண்டுமே அனைத்து விமர்சகர்களுக்கும் பொருந்தும் என நினைக்கிறன். தமிழ் வெளியில் நக்கலும் கிண்டலும், சீண்டும் கூற்றுகளுடனும், பொத்தாம் பொது அபிப்ராயங்களுடனே படைப்புகளைப் பற்றிய விமர்சனங்கள் வலம் வருகின்றனவே, அவை விமர்சனம் இல்லையா? விமர்சனங்கள் விரிவானவை. நுணுக்கங்கள், விமர்சிக்கும் படைப்பின் அறிவும், அதன் துறை சார்ந்த அறிவும் அதன் மூலம் படைப்பை அணுகுதல் என்று விமர்சனத்திற்கென்று ஒரு கட்டமைப்பு உண்டு. ஓரிரு வரிகளில் அதைச் சொல்ல முற்படுவது விமர்சனமாகாது. மாறாக, ஒரு சாமான்யன் சொல்வதைப் போன்ற வெறும் தனிமனிதக் கருத்து மட்டுமே. சில நேரங்களில் எழுதுபவரின் மொழி ஆளுமையில் நமது மனம் லயிக்கும். அத்தருணங்களில், வெறும் தனிமனிதக் கருத்தை விமர்சனம் என்று பொருள் கொள்ளக் கூடாது. அதிலும் குறிப்பாக, மனதில் தோன்றியதை ஓரிரு வரிகளில் சமூக வலைத்தளங்களில் ஜல்லியடிப்பதை விமர்சனங்களுடன் குழப்பிக் கொள்ளக் கூடாது.